24-week fetuses have impressive lung development as primitive gas exchange now becomes possible in the event of premature birth. Terminal sacs now appear which will eventually become alveoli.1 Alveoli become the site for the oxygen/carbon dioxide exchange and are essential for survival outside of the womb. 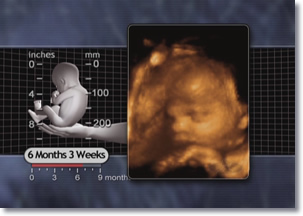 This 3D ultrasound image reveals a fetus at 25 weeks. The eye sees with two types of light-detecting cells. It uses rods to see in dusk and darkness, and cones to see in the light. Cones show us fine detail and color, but need relatively optimal conditions to see well. The six to seven million cones in each eye can be divided into "red," "green," and "blue" cones, according to what color the cone perceives. The estimated 100 million rods in each eye are perhaps 300 times more sensitive than cones. They enable us to see in low-light conditions, but create only a coarse, grey image. The rods adapt more slowly than the cones, and therefore optimum adaptation to darkness typically occurs after thirty minutes or more. Whether using "cones" to see in the light, or "rods" to see in dusky conditions, our eyes are amazingly adaptable to our surroundings. 1 Arthur C. Guyton and John E. Hall, Textbook of Medical Physiology, 10th ed. (Philadelphia: W. B. Saunders, 2000), 582-584. 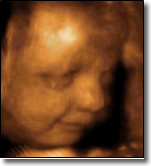 The eye is substantially developed in the second trimester, and can produce tears at 26 weeks. 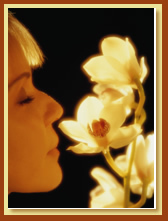 Smells enhance many experiences throughout life. The ability to smell is operational before birth. 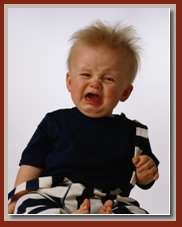 The fetus does not like bitter tasting substances any more than you or this little boy. Eating something we enjoy prompts a very different response! These chubby cheeks do more than make Dad smile – the extra fat helps a newborn baby stay warm. 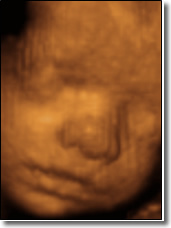 This 3D ultrasound image shows a 27 week fetus already able to do somersaults. Increasingly sensitive to different sound frequencies, the fetus is now able to hear many new noises with greater accuracy. 1 DiFiore and Wilson, 1994. 222. 2 Moore et al., 2000. 154. 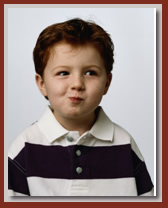 3 American Academy of Pediatrics, 1999. 684; Halliday, 1997. 233. 4 Dobbing and Sands, 1973. 764-765; Growth of the human brain, 1975. 6; Mancuso and Palla, 1996. 290. 6 Noback et al., 1996. 266. 7 Isenberg et al., 1998. 773-774. 8 Robinson and Tizard, 1966. 52. 9 Noback et al., 1996. 263. 10 Lecanuet and Schaal, 1996. 3. 11 Lecanuet and Schaal, 1996. 3; Liley, 1986. 13; Reinis and Goldman, 1980. 227. 12 Liley, 1972. 102; Moore and Persaud, 1998. 234; Moore and Persaud, 2003. 219. 13 Mennella et al., 1995. 207. 14 Trudinger and Cook, 1990. 183-184. 15 England, 1983. 29; Pringle, 1988. 181. 16 Guyton and Hall, 2000. 786. 19 Liley, 1986. 11; Liley, 1972. 100. 20 Glover and Fisk, 1999. 882; Hepper and Shahidullah, 1994. F81.